Whether one regards President Trump’s declaration that Jerusalem is the capital of Israel as a dangerous and foolhardy move or wise and deeply principled, it cast a well-deserved bucket of cold water into the faces of the Arab and European worlds. But it also begged a question: What, exactly, is “Jerusalem”? That never happened. The Jewish Agency for Palestine accepted the partition plan; the Arabs did not. And the following year, on the very day the British Mandate ended, the Arabs invaded the Jewish community, starting a war which, to the invaders’ surprise, they decisively lost. So, in fact – and despite what many media persist in stating – the Corpus Separatum status of Jerusalem, as part of the Arab-rejected partition plan, never became reality. When Israel declared its independence in May, 1948, the western half of the expanded city of Jerusalem became part of the nascent state, while the eastern half, purged of its Jews, along with the Old City, was occupied by Jordan. As we all know, and some of us vividly remember, during the 1967 Six Day War, Israel rebuffed Egypt, Jordan and Syria, and captured the Golan Heights, the Sinai Peninsula, Shomron and Yehudah, including the eastern part of Jerusalem and the Old City. The Old City. The Ir Haatikah. We sometimes forget that, while Israeli law and colloquial shprach applies the name “Yerushalayim” to the greater metropolitan area outside its walls as well, the name really refers to the Old City alone. Chanukah is coming to an end, which, to Jews who mark time Jewishly, means that the next celebration in our sights is Purim. And hidden in Megillas Esther, as it happens, is a passuk that holds a hint well worth pondering in the context of recent events. “Ad chatzi hamalchus,” Achashveirosh offers Esther, “up to half the kingdom” (Esther, 5:3). The Gemara (Megillah 15b) explains that Achashverosh said “up to” in order to indicate that he was not willing to offer something in the middle of the kingdom, something that would cause a political rift were he to relinquish his control over it: the Beis Hamikdash. We optimists hope that Mr. Trump’s recent blunt statement might, in the end, push the Arab world to come to terms with reality and actually shuffle, grumbling but surely, to the negotiation table. To fantasize further, maybe Arabs in Eretz Yisrael will be brought to see the incitement and hatred they sow as counterproductive to their goal of a state alongside Israel, and desist from their regularly scheduled vilifications of Israel and Jews. Unlikely, certainly. But, whatever our personal feelings about whether a “two-state solution” is a healthy or a noxious prospect, it is the declared goal of both Mr. Trump and Israeli Prime Minister Netanyahu. So let’s imagine further what might emerge from such an agreement. It really doesn’t need much imagination; the general terms of a peace agreement have long been obvious to all informed observers. Parts of Yehudah and Shomron, from which Israel’s withdrawal would not pose undue security risks, would be ceded to the Arab state. The state would be demilitarized, and pledged to abandon its hostility toward Israel. 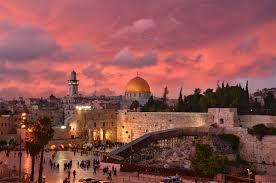 The western part of Jerusalem would remain Israel’s capital, and the eastern part, the new state’s. And the Old City? Oy, there’s the rub. Would – could? – Israel cede even part of it to an Arab state? And even if it did, what about the source of the city’s kedushah, the Mekom Hamikdash? Truth be told, Israel is not really in possession of that sacred ground even now. While she controls access to the Temple Mount, the compound is administered by the Wakf, itself controlled and funded by the Jordanian government. That sad reality is not likely to change, not until we merit the bias go’el tzedek. Until then, though, it should be a reminder that, even were “Jerusalem” to be recognized as the capital of Israel by the entire civilized world, even by all Arab countries and a new Arab state, rejoicing would be premature. Klal Yisrael remains, l’daavoneinu, stalled in galus. May that situation end bimheirah biyameinu. This entry was posted in Israel, Jewish Thought, News on December 21, 2017 by Rabbi Avi Shafran.